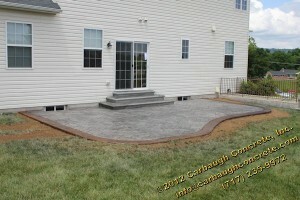 Located in the Hickory Ridge development in York, our customer was looking to have a patio installed. This project included an approximately 480 square feet stamped concrete patio with a stamped concrete step and a textured border. Our customer wanted a larger ashlar pattern, so we used Regal Ashlar for this project. The customer selected a bull nose pattern for this step face and a slate texture for the step tread and the textured border. Also included in this project were custom-formed window wells and custom-made grates for the window wells. The patio was stamped on a bias to enhance the appearance. 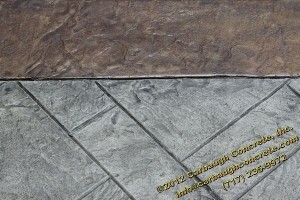 The textured border was stained in a natural earth tone and helps the patio to stand out. The Regal Ashlar is a new stamp pattern for us this year. This project was the first for this pattern and we are beyond pleased with the final result. Contact us today to schedule a free estimate for your own Regal Ashlar stamped patio! 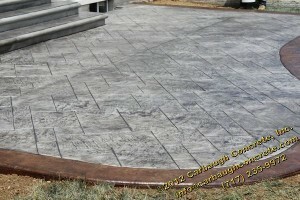 See additional stamped concrete project images in our gallery.